Prevalence; Latent Tuberculosis; Health Personnel; Tuberculin Test; Interferon-gamma Release assays; Oman. Objectives: Data on the prevalence of tuberculosis (TB) in healthcare workers (HCW) in Oman and the Arabian Gulf is scarce. The aim of this study was to estimate the prevalence of latent tuberculosis (LTB) among HCW exposed to active TB in one of the tertiary care hospitals in Muscat. Methods: Exposed HCW were screened for LTB from January to June 2012 using skin tuberculin and serum interferon tests. Candidates were followed-up for a total of nine months. Descriptive statistics were used to summarize the data. Results: A total of 371 exposed HCW were involved in the study. The incidence of LTB in exposed HCW was 33.2% (n = 123). Almost 54% (66/123) of the HCW started treatment and only 42.4% (28/66) completed the full nine-month treatment course. Conclusions: The high prevalence of LTBI in exposed HCW merits further evaluation of the screening and treatment programs in the country. Future countrywide studies are warranted to provide more precise statistics on the prevalence and management of this public health issue. In Oman, extensive programs have been implemented to reduce the incidence of TB. In 1981, the National Tuberculosis Program was launched and successfully reduced TB cases (all forms) from 928 in 1981 to 213 in 2010. The aim of the program was to reduce the incidence of smear-positive TB from 4.29 per 100 000 population in 2010 to 1 per 100 000 in 2015.3 Since the early 1970s in Oman, the Bacillus Calmette-Guerin (BCG) vaccination is given at birth as part of the immunization program. Despite all the hard efforts directed to control TB in the country, data on the prevalence of TB in HCW is scarce. Our study describes recent TB exposure among HCW in a large tertiary care hospital in Muscat. This cross-sectional study was conducted at the Royal Hospital, one of the major tertiary care hospitals in Muscat. Eligible candidates were enrolled between January and June 2012 and followed-up for nine months. A total of 12 and 14 patients with smear-positive TB were recorded in 2011 and 2012, respectively. There are approximately 3000 HCW in the hospital, which has a 650-bed capacity (including medical and non-medical beds). The exposed HCW included attending doctors, nurses, paramedics, and trainers in the health care profession. All HCW with significant and insignificant exposure to the index cases were included. HCW who had active TB, a history of TB, < 18 years of age, and those who were not in contact with the two index patients were excluded from the study. Electronic medical records of the exposed HCW were obtained and reviewed for information about their age, gender, nationality, employment year, department, and job characteristic. They were screened for any alarming symptoms and had a tuberculin skin test (TST). Blood was collected simultaneously for basic laboratory investigations including erythrocyte sedimentation rate (ESR), liver function test (LFT) and Quantiferon-TB Gold (QFT, QIAGEN, Hilden, Germany). Furthermore, a chest X-ray was also taken as a screening tool. TST was administered by trained nurses using tuberculin purified protein derivatives (Mantoux; Sanofi Pasteur, Ontario, Canada). Participants were requested to report after 72 hours for a proper reading. Induration of ≥ 5 mm was considered positive based on Centers of Disease Control and Prevention (CDC) guidelines for diagnosing LTB in settings of recent exposures to index cases with active TB.5 LTB was diagnosed when there was evidence of TB infection either by positive TST or by a positive interferon-gamma release assay (IGRA) result with no clinical or radiological evidence of active disease.6 Active TB was strongly suggested if the HCW had symptoms highly suggestive of tuberculosis (e.g., productive cough, night sweats, anorexia, and weight loss), a chest radiograph suggestive of TB, or acid-fast bacilli (AFB) in their sputum. Analysis was performed using descriptive statistics. Among the 371 HCW screened and followed-up, 248 (67%) were females. The age of exposed HCW ranged from 20 to 65 years (median = 33 years). Furthermore, most of the exposed HCW were of younger age groups (21–30 and 31–40 years making up 40% and 37%, respectively). The exposed HCW were of different nationalities: 64% (n = 238) were Omani and 25% (n = 92) were Indian. The majority of the exposed staff were from the medical department (n = 214; 57.7%) followed by ancillary services (n = 20; 5.4%), rotating nursing (n = 20; 5.4%), and 4.3% were medical students (n = 16). Nurses represented 56.6% (n = 210) of HCW and doctors 25.1% (n = 93). A total of 362 (97.6%) of HCW had a TST. This was performed by trained nurses and was read after 72 hours. Of those who had a TST, 71 (19.6%) did not report for reading on time, 207 (57.2%) had a negative reaction and 84 (23.2%) had a positive reaction. Among the 207 exposed HCW who had a negative TST reaction, 39 (18.8%) had a positive IGRA test. On the other hand, among the HCW who had a positive TST reaction, 36 (42.8%) also had positive IGRA test while 17 (20.2%) had a negative test. Seventy-one (84.5%) HCW had induration between 10–20 mm. A total of 123 (34.0%; n = 362) HCWs were positive for either TST or IGRA test. No cases of active TB were diagnosed [Figure 1]. Exposed HCW that were found to have positive TST or IGRA tests were assessed, evaluated, and followed up by infectious diseases specialists. A nine-month treatment of isoniazid for LTB was offered only after a thorough risks and benefits assessment. Out of the 123 HCW advised treatment for LTB, only 66 (53.7%) accepted to take the treatment. These HCW were reviewed at three-month intervals to ensure good compliance and monitor any complications while on treatment. However, only 28 (42.4%) completed the treatment. 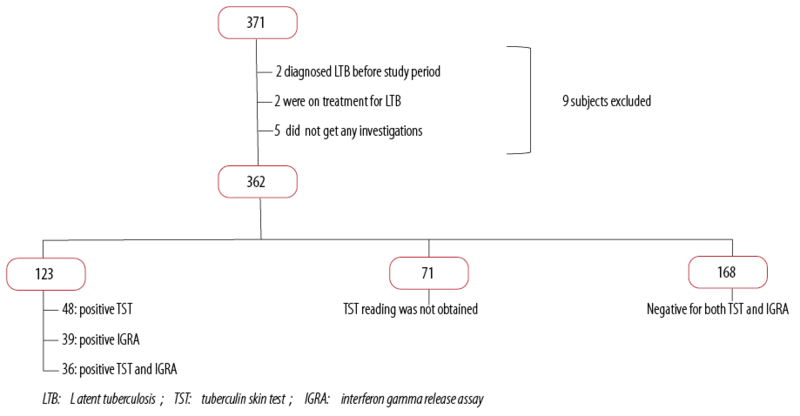 Figure 1: Latent TB screening results for study sample. This is the first study on LTB in HCW in Oman. The study was conducted during an investigation of exposure of HCW to TB cases. The opportunity was taken not only to look for significantly exposed HCW to that particular case but also to other HCW with insignificant contact in the same department. In our study, most of the participants who presented for screening and completed their follow-ups were Omani. This is explained by the wide false warning among the foreigners working in the health sector in the country that if they were diagnosed with TB they would be asked to leave the country. Although this may be true for active and open TB cases, it is not applicable for LTB.10 None of the LTB cases discovered in this study (in non-citizen HCW) had any medicolegal consequences. Furthermore, most of the participants were from the nursing department. This is due to emphasis by nursing administrative staff on enrolling their staff in screening programs. Various screening tests from different organizations have been recommended for LTB in HCW. While the Canadian guidelines recommend using TST, the American and the British guidelines recommend using either TST or IGRA test, but not both together.11 Although we used both screening tests in most cases, participants were labeled to have LTB if either test was positive. The TST measures a delayed type hypersensitivity response to purified protein derivative (PPD), a mixture of antigens shared among Mycobacterium tuberculosis, BCG, and several non-tuberculous mycobacteria.12 Until recently, TST was the only available test for LTB screening. Using TST alone might result in treating HCW uninfected with TB. Apart from the low specificity of the TST test, it also cannot differentiate infection with tuberculous mycobacterium from infection with non-tuberculous mycobacterium or before BCG vaccination. However, TST remains the favorable test in low-income countries because it is relatively cheap and as sensitive as the IGRA.13 On the other hand, the IGRA test has a very high negative predictive value reaching up to 99%. This means that a negative test can almost rule out infection.14 Hence, many health care organizations have adopted a two-step approach for screening. This involves screening all HCW with TST and restricting the IGRA test only for those who had positive TST.10,15 Nevertheless, both tests (TST and IGRA) have modest predictive value and may not identify those who are at highest risk of progression to TB disease in high-incidence countries. Furthermore, the role of the IGRA in detecting LTB in HCW remains controversial.16,17 While some studies found that the assay appears to perform better in low versus high TB incidence countries,16 others have suggested lower sensitivity of IGRA than TST in detecting LTB.17 Furthermore, IGRA has demonstrated poor agreement with the TST, except in countries with high incidences of TB.18 Unfortunately, HCW applying to work in Oman are screened for active or old TB by performing chest X-rays, but they are not screened for LTB. We found a prevalence of 34.0% of LTB in our institute. It is hard to conclude if this is high because of the lack of similar studies in the region and previous research in the country. High endemic countries like India and China have a prevalence of LTB in HCW as high as 40% and 34%, respectively.7,19 Another study from Malaysia showed an incidence of 11% of LTB in HCW.1 Additionally, studies from Georgia, USA, measured an incidence of 31% in HCW not involved in TB caring facilities and 55% in those involved in TB healthcare facilities.20 A similar study in a teaching university hospital in Iran showed a prevalence of only 14%. This low prevalence could be partially explained by the low number of participants (n = 183) in their study or as a result of screening LTB rather than exposure to active TB.21 The majority of HCW in our study had no prior screening for LTB. Taking into account all the studies mentioned above, the prevalence of 34.0% shown in our study might reflect a high prevalence and a serious evolving medical problem in Oman. Our study had several limitations. Although it shows a significantly higher prevalence of LTB, it is limited to workers in one medical institute. Future research, including workers in multiple regions of the country and several medical institutes, would provide a more accurate prevalence of TB in HCW working in Oman. The majority of our participants were Omani. Although there are many HCW from countries with a higher prevalence of TB, very few of them participated in the study. We might have had a higher prevalence if more of these HCW were involved. Additionally, some HCW did not present for the TST reading (71 HCW, 20%). This could have biased the prevalence, either way. They may be encouraged to involve themselves in future studies by clarifying repatriation roles of the Ministry of Health in the context of active and latent TB. Furthermore, neither BCG vaccination nor HIV status was checked in our study. This illustrates the need for more studies addressing these issues in our health sector. Our study showed a significant problem of TB developing in the sector of HCW with a considerable decline in its treatment. This problem needs to be addressed and managed before it complicates national TB control programs. High suspicion of TB by clinicians, and adequate infection control measures by the hospital authorities, including the availability of negative pressure isolation rooms and early identification of LTB, in HCW by occupational specialists form the essential components of a comprehensive package to prevent TB in HCW.32 We propose a widespread national two-step screening program to be started and to treat high-risk people for this condition. We take this opportunity to thank all staff who kindly participated in the study. Baussano I, Nunn P, Williams B, Pivetta E, Bugiani M, Scano F. Tuberculosis among health care workers. Emerg Infect Dis 2011 Mar;17(3):488-494. Communicable Disease Surveillance and Control, Ministry of Health, Muscat, Sultanate of Oman, unpublished data 2012. Communicable Disease Network Australia (CDNA) Guidelines for the Public Health Management of Tuberculosis, May 2015. National Tuberculosis Controllers Association; Centers for Disease Control and Prevention (CDC). Guidelines for the investigation of contacts of persons with infectious tuberculosis. Recommendations from the National Tuberculosis Controllers Association and CDC. MMWR Recomm Rep 2005 Dec;54(RR-15):1-47. Getahun H, Matteelli A, Chaisson RE, Raviglione M. Latent Mycobacterium tuberculosis infection. N Engl J Med 2015 May;372(22):2127-2135. Pai M, Gokhale K, Joshi R, Dogra S, Kalantri S, Mendiratta DK, et al. Mycobacterium tuberculosis infection in health care workers in rural India: comparison of a whole-blood interferon gamma assay with tuberculin skin testing. JAMA 2005 Jun;293(22):2746-2755. Government of Western Australia, Department of Health, Operational Directive, Tuberculosis and Health Care Workers, F-AA-04578, 06 July 2011. Joshi R, Reingold AL, Menzies D, Pai M. Tuberculosis among health-care workers in low- and middle-income countries: a systematic review. PLoS Med 2006 Dec;3(12):e494. Al Jahdhami I. Latent tuberculosis in healthcare workers: time to act. Oman Med J 2013 Mar;28(2):146-148. Horsburgh CR Jr, Rubin EJ. Clinical practice. Latent tuberculosis infection in the United States. N Engl J Med 2011 Apr;364(15):1441-1448. Mirtskhulava V, Kempker R, Shields KL, Leonard MK, Tsertsvadze T, del Rio C, et al. Prevalence and risk factors for latent tuberculosis infection among health care workers in Georgia. Int J Tuberc Lung Dis 2008 May;12(5):513-519. 13. Zumla A, Raviglione M, Hafner R, von Reyn CF. Tuberculosis. N Engl J Med 2013 Feb;368(8):745-755. Girardi E, Angeletti C, Puro V, Sorrentino R, Magnavita N, Vincenti D, et al. Estimating diagnostic accuracy of tests for latent tuberculosis infection without a gold standard among healthcare workers. Euro Surveill 2009;14(43):19373. Lawn SD, Zumla AI. Tuberculosis. Lancet 2011 Jul;378(9785):57-72. Joshi R, Narang U, Zwerling A, Jain D, Jain V, Kalantri S, et al. Predictive value of latent tuberculosis tests in Indian healthcare workers: a cohort study. Eur Respir J 2011 Dec;38(6):1475-1477. Zwerling A, van den Hof S, Scholten J, Cobelens F, Menzies D, Pai M. Interferon-gamma release assays for tuberculosis screening of healthcare workers: a systematic review. Thorax 2012 Jan;67(1):62-70. Swindells JE, Aliyu SH, Enoch DA, Abubakar I. Role of interferon-gamma release assays in healthcare workers. J Hosp Infect 2009 Oct;73(2):101-108. Zhang X, Jia H, Liu F, Pan L, Xing A, Gu S, et al. Prevalence and risk factors for latent tuberculosis infection among health care workers in China: a cross-sectional study in China. PLoS One 2013;8(6):e66412. Whitaker JA, Mirtskhulava V, Kipiani M, Harris DA, Tabagari N, Kempker RR, et al. Prevalence and incidence of latent tuberculosis infection in georgian healthcare workers. PLoS One 2013;8(3):e58202. Nassaji M, Ghorbani R. Risk factors for latent tuberculosis infection among healthcare workers in a university affiliated hospital. South Afr J Epidemiol Infect Dis 2012;27(1):30-33. Gershon AS, McGeer A, Bayoumi AM, Raboud J, Yang J. Health care workers and the initiation of treatment for latent tuberculosis infection. Clin Infect Dis 2004 Sep;39(5):667-672. Balkhy HH, Miller TL, Ali S, Nuzzo JB, Kentenyants K, El-Saed A, et al. Compliance with postexposure screening and treatment of latent tuberculosis infection among healthcare workers in a tertiary care hospital in Saudi Arabia. Infect Control Hosp Epidemiol 2014 Feb;35(2):176-181. Soobratty MR, Whitfield R, Subramaniam K, Grove G, Carver A, O’Donovan GV, et al. Point-of-care urine test for assessing adherence to isoniazid treatment for tuberculosis. Eur Respir J 2014 May;43(5):1519-1522. Tshitangano TG. The management of latent tuberculosis infection in health care workers at hospitals in Vhembe district. Occupational Health of Southern Africa 2013;19:14-19. Churchyard GJ, Fielding KL, Lewis JJ, Coetzee L, Corbett EL, Godfrey-Faussett P, et al; Thibela TB Study Team. A trial of mass isoniazid preventive therapy for tuberculosis control. N Engl J Med 2014 Jan;370(4):301-310. Menzies D, Fanning A, Yuan L, Fitzgerald M. Tuberculosis among health care workers. N Engl J Med 1995 Jan;332(2):92-98. Sterling TR, Villarino ME, Borisov AS, Shang N, Gordin F, Bliven-Sizemore E, et al; TB Trials Consortium PREVENT TB Study Team. Three months of rifapentine and isoniazid for latent tuberculosis infection. N Engl J Med 2011 Dec;365(23):2155-2166. Ho TB, Rayner CF, Lindfield T, et al. Prevalence of TB in health care workers in South West London. Thorax 2005;60:173. Casas I, Esteve M, Guerola R, García-Olivé I, Roldán-Merino J, Martinez-Rivera C, et al. Incidence of tuberculosis infection among healthcare workers: risk factors and 20-year evolution. Respir Med 2013 Apr;107(4):601-607. Lambert LA, Pratt RH, Armstrong LR, Haddad MB. Tuberculosis among healthcare workers, United States, 1995-2007. Infect Control Hosp Epidemiol 2012 Nov;33(11):1126-1132.
de Vries G, Sebek MM, Lambregts-van Weezenbeek CS. Healthcare workers with tuberculosis infected during work. Eur Respir J 2006 Dec;28(6):1216-1221.